Traveling Marla will stick her head in [just about] anything! Will you? Win a jar of apple butter that Marla helped stir! Read the post to find out how! I will stick my head in anything. Okay, maybe that’s a little bit of a yarn, but I really do love those plywood cutouts with a silly scene just begging passersby to insert their noggins. So as you can imagine I was ecstatic to pose, Marla Appleseed style. Kurt was, well, a little less than thrilled, but always a good sport. An even better sport was the poor fella with his arm in a cast who I asked to take the photo. We often go to our permanent house in Pennsylvania on weekends, which works well given our house-sitters there like to go traveling, visiting and flea-marketing on weekends. My arms ain’t got nothin’ on that sweet girl standing behind me. She stirs this pot for up to six hours before those apples are turned into sauce. It was fun to try though. I realized I would not survive the century in which this would have been daily life. I would have either been a “saloon girl” or an outlaw. This kind of domestic wifery woulda’ killed me. CONTEST RULES: Stick your head in something and send me your photo! Don’t endanger yourself, but be creative. Make a cardboard cutout, go between someone’s legs (clothed! ), put your head out a goofy window, peek through a fence or, oh I’m sure you can think of something much more entertaining to stick your head into. Submit your photo by MIDNIGHT next Thursday, November 1st. You can either email them to me (marla at marlasinkdruzgal dot com) or you can send them via Facebook message on my official writer page. I will post photos on Friday’s blog (Nov 2nd) and put up a poll. Most votes by midnight of the following Sunday wins the quart of apple butter!! EVERYONE who enters gets a special Traveling Marla postcard! *Please note: I can’t afford international shipping. International participants can enter, but you will only win a postcard from me (and my undying love). Good luck and I can’t wait to see how creative you are! P.S. Are YOU in one of the photos in the gallery below? Please let me know and I would love to update the photo with your name or the name of your business. Or just say hello and let me know how you enjoyed the festival! Boy Scouts were among the many vendors at the Apple Butter Stirrin Festival in Roscoe Village last weekend. Were you there? Please say hello or identify yourself in a photo! Wind and rain threatened Friday afternoon of the festival, with at least one vendor losing a tent. Seriously, how cute is this baby?? He seemed to be enjoying the nice day and hopefully got to take home some apple butter! Glass-Spinners’ Richard Brzezicki creates a dragonfly for onlookers. I was happy to find he had one in my favorite color, yellow. More than just sun-catchers, Doris makes beautiful tri-loom shawls as well. Holding up your jar of apple butter, dear reader! I hope you win it!! I rarely saw the same faces twice (except for vendors of course) in our three days of popping in and out of the festival. History is alive every day in Roscoe Village, but the Apple Butter Stirrin Festival brought together even more period costumes. 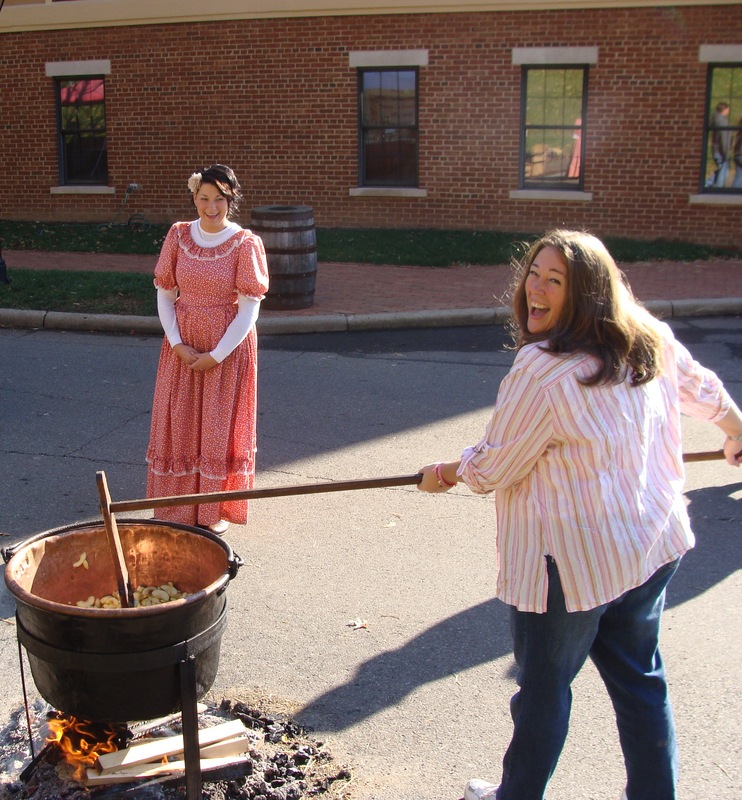 This picture combines Coshocton’s canal boat history with her popular apple butter stirrin’ festival. I think pretty much all the cutest kids in the world were at the Apple Butter Stirrin’ Festival, starting with these three. The Nicholas Family/ Country Sunrise Special performs on the main stage at Roscoe Village for the Apple Butter Stirrin’ Festival on Sunday morning, Oct 21st. I was SO excited to meet Michael of Simple Gourmet Syrups at the festival. I bought his Shagbark Hickory Syrup at Medberry Marketplace a couple weeks ago and Kurt and I LOVE it! I am going to interview him and introduce you fully to his delicious products soon! Roscoe Village shops participated in the festival, drawing shoppers from the crowded center stalls. I was kicking myself because I wanted to get a bottle of fish oil from these guys. I take fish oil daily for my cholesterol. It was a hectic weekend for me, running back and forth between the Apple Butter Stirrin’ Festival and the Fall Foliage Tour, trying to get as many good pics from each as weather permitted. We stopped by the quilt vendor many times. Although I want to make one (“someday”) I would have loved to buy the knotted quilt we saw hanging on the final day. Denise and Kristina of Westbrook’s Cannery greeted us with friendly smiles and a fresh pot of apples when we arrived on Sunday. More quilts! I hope this vendor did well in sales, because it was definitely one of the more popular browsing stalls over the weekend. Traveling Marla will stick her head in [just about] anything! Will you? Win a jar of apple butter that Marla helped stir! Read the post to find out how! Let’s get this party started! Entrance fee was only $3 per day or $5 for a 2 day pass. More than worth all the free samples, free music and cool booths! The Queen’s Attendant, striking against the orange and gold foliage behind her. We returned to Westbrook’s Cannery at the end of Sunday to pick up our jars of apple butter. The whole process takes about six hours. These ladies have strong arms. I know, because I only stirred for a few minutes and wussed out. We met the sweetest attendant at the entrance to the festival. She seemed to greet everyone with the same enthusiasm and welcoming attitude! 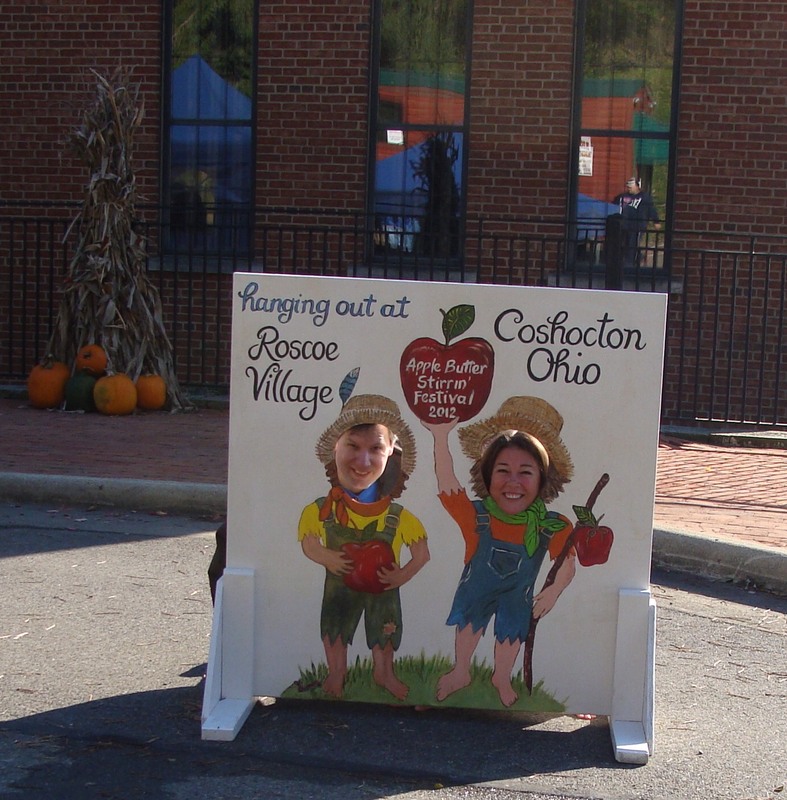 Roscoe Village stores welcomed visitors to the festival by having sales and decorating storefronts in festival fall decor. Nothing steals any show like a puppy, especially a tumbly bumbly golden retriever. Stirring the apples with Westbrook’s Cannery. With tickets at only $1 each or 6 for $5, I was happy to try my luck on the raffle for this beautiful handmate quilt. I didn’t win, but now am obsessed with making a quilt, even more than before. I’ve decided it’s one of my goals for when we move to South Africa. I might finally be still enough to try it! Jars of the apple butter that I stirred for a few minutes were waiting for us when we returned. Delicious! Am I the only one who wants to know what conversation took place between the union soldier and the foxfire survival man about this gun? Makes me want to go shoot my muzzleloader. I’ll send my entry for the contest soon, this gonna be fun. I already gave to the Red Cross for Hurricane Sandy Disaster Relief, but I’ll give again! For every entry I get (MAX=15 because I’m still not rich except in your love <3) I'll donate $10 to the Red Cross HS Disaster Relief. DEADLINE = TOMORROW (Thursday) at MIDNIGHT. What are you waiting for? Go stick your head in something already and send me a pic!!! Thanks, buddy! I hope you enter the contest! Spent one fall day years ago making apple butter with my grandparents and aunt’s family. Remember being both fascinated and grossed out at the fact that washed (but discolored) pennies went into the bottom of the pot, but nice shiny pennies came out at the end of the day. Years later I thought to myself “Pappy Rhea was not the most careful of apple sorters – I wonder how many worms and/or rotten apples made it into the apple butter?” Given all that I’d love to have the opportunity to do it again…. I used to think the same thing about worms. I never made apple butter, but I remember going to the orchards in the fall to pick apples and having to dig out the worms before we could make pie or applesauce. I was sooooo young. Those were the best tasting apples though. I know you must have a photo that would work for this contest!